Halberstadt (Roughneck Nine-One), a prolific chronicler of the U.S. military, pulls no punches in this uncompromising examination of the shadowy world of the combat sniper. Halberstadt warns forthrightly that this is a book about ""the business of hunting people . . . and killing them in a calculated, methodical way"" and ""requires brave readers."" 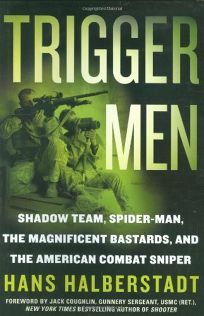 Drawing on the observations of thirty military snipers and his own time shadowing Army Sniper Class 2006-3 through five weeks of grueling training, the author methodically surveys the training, weapons, traditions, and missions of modern military snipers. There is ample technical information about the snipers' primary weapons-the M24 and M40 sniper rifles-and the vagaries of engaging long-range targets-referred to as voodoo ballistics by practitioners. There also is an insightful analysis-with first-person commentary from veterans of Iraq-of the changing role of the sniper on the modern urban battlefield. No longer the ""unloved stepchild,"" today's sniper is a major part of the new battle space and is responsible for a disproportionate number of enemy casualties. As Halberstadt warns, this book is not for the squeamish, but for those looking for a thorough primer on the role of the military sniper in today's counterinsurgency missions, this is a solid introduction.